I recently got to go to a great event at Whole Foods (literally heaven on Earth) called Yoga for Foodies which is pretty self explanatory, as basically, we did yoga and got to try some amazing dishes from Natasha Corrett’s new book, Honestly Healthy For Life. The book is amazing and I got some inspiration from it to make some zucchini noodles as soon as I got home. 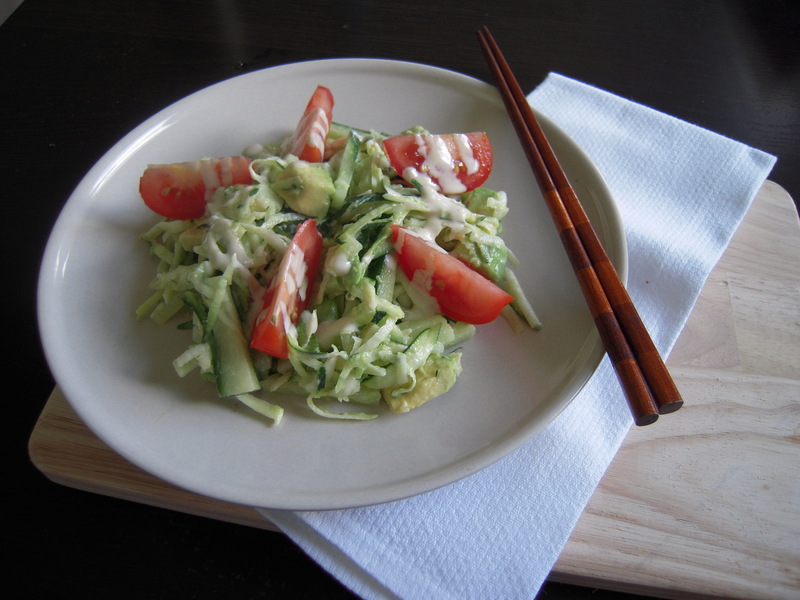 I whipped up a super quick dressing and put it in the noodles with some avocado, tomatoes and cucumber for a simple lunch, but it turned out amazing – super decadent and creamy and rich but super healthy and good for you! Tahini has a multitude of benefits as it’s full of protein (great for anyone on a plant based diet), alkaline, one of the best sources of calcium, contains a TON of vitamins and mineral. If you haven’t jumped on the tahini bandwagon, you better get on now! optional: shredded chicken, prawns, sugar snap peas etc. note: feel free to use a spiraliser if you own one, but I use a box grater to make my ‘noodles’, which is a tip from Izy’s blog! Get a box grater and make the courgettes into noodles by grating it down the grater once (you may want to watch the video to understand this). Make the dressing by combining the ingredients and add more salt, lemon juice, etc to taste and make sure it’s a good consistency (you don’t want it to be too thick or it will clump and be quite cloying). Mix the noodles with the dressing and scatter with other vegetables. That looks really healthy. 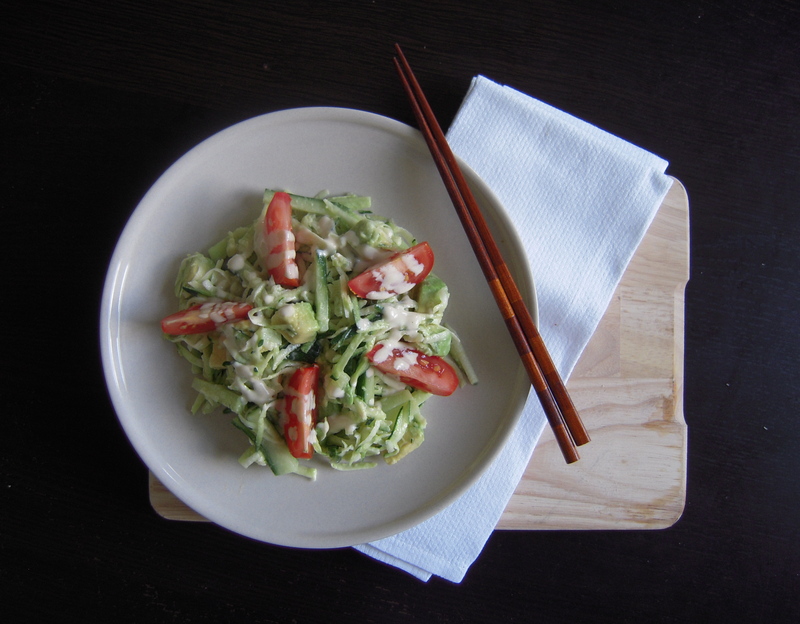 I like serving zucchini noodles with a pasta sauce but this is a nice alternative. Thanks Lorraine! It’s really light and cooking in the hot summer! Easy summer recipe Millie! Inspired me to do something with zucchini! Keep up the good work. Thank you Des! Glad you enjoyed the recipe and can’t wait to see what you come up with! 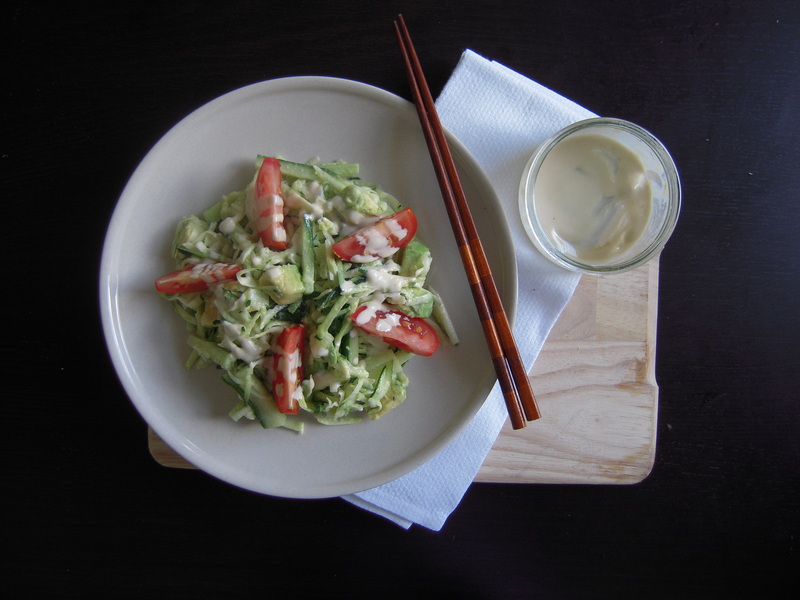 Yum love tahini dressing in absolutely anything else from ‘noodles’ to grains! Me too! It’s been my new obsession recently haha! Thank you Desme!! Hope you enjoy it!